Spinoffs in popular franchises have delivered historically mixed results over the years, but when Capcom spun the X series off of Mega Man, not only did they create a new line every bit as intense and engaging as the originals, but arguably even more polished and fun to a certain degree. And now, after a rather lengthy wait, Capcom have thankfully brought the first release in the Mega Man X series to the Virtual Console. Anyone that's ever played a Mega Man title should feel right at home with Mega Man X. Not only is the basic gameplay very similar in style and execution, the progression and overall goals are pretty much the same as well. You're able to select any of the eight Maverick stages right from the get-go, and as you defeat each Maverick you'll gain access to that particular robot's special weapon, which just so happens to be Kryptonite to one of the other bosses. So, once again, the order in which you attack these stages will have a significant effect on your battles with the many bosses. The main character, X, looks and controls much like the original Mega Man. You'll still run, jump, and shoot your way through a variety of situations, but here the developers added a few modern touches to liven things up a bit. Now you can not only hang on to and jump up along walls, you can hold a powered-up X-buster shot and also locate upgrade pods that will give access to new moves like the Dash and an even stronger X-buster. While these might seem like rather trivial enhancements, they add a wealth of new variety to the Mega Man experience. 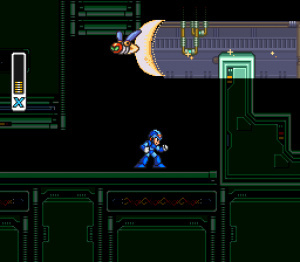 To say that the developers nailed the controls in Mega Man X would be a gross understatement. The controls are spot-on and provide the perfect level of responsiveness. Even the boss fights feature some amazing movement and attack patterns that will test your wit and problem-solving skills, not to mention your reflexes. And when you toss in a ton of other surprises, like the way defeating a boss in one level will affect things in another level, you get a game that's extremely deep and soaked in replay value. 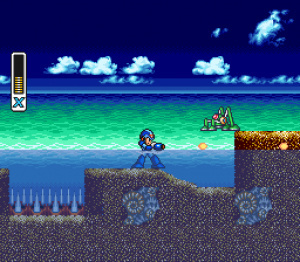 As you'd expect from the 16-bit step up, the visuals in Mega Man X are nicely detailed and feature all of the vibrant scenery that players have come to expect from the series. The majority of the characters, enemies, and bosses are also quite a bit larger in size this time around, giving them an even more intimidating aura. The developers have even been kind enough to toss in a few special effects to give it that signature SNES appeal. If there's one aspect of the Mega Man series that's always impressed over the years, it's the game's musical score and sound effects package. And while the game could have easily forsaken the chip tune style given the improved might of the SNES's sound chip, it instead takes the classic chip tune sound and somehow layers it with a host of more modern synthesized audio touches without losing the classic feel. You'll even find a few familiar-sounding tracks to get your nostalgia flowing. Mega Man X is one of the strongest action/side-scrollers in video game history and a title that more than lives up to the Mega name. Not only does it capture everything that was great about the original NES series, it also manages to add a wealth of new ideas to the mix without taking anything away from the overall experience. There are those who might claim that a spinoff can never be as great as the original, but those people obviously have never taken this phenomenal side-scroller for a spin. I already own this on SNES, so I won't be downloading it, but MegaMan X is freaking awesome. I can't beat any of the games in the regular series, but the X series is much more fun and easier for me. I have the original SNES cartridge with matching box and manual to boot. Now there is really no reason to not play this classic title. I hope Capcom releases X2 and X3 to the VC in the near future. I downloaded! It's fun...my first MMX game ever. Never did beat this game...some of the last bosses you fight at the end caused me to quit. I remember some freaky vehicle thing, and the final boss...which I couldn't even figure out how to defeat. Anyways, need to get this game again somehow, I loved it. @Grenworthshero: Wow I have the exact opposite problem. I can beat all the original Megaman games except for 8 but thats cause I cant get pass the voice overs and graphics but find the X series a bit harder. Great rewiew as always Corbie I will be picking this one up for sure next payday. X-ceptional!! Nice play on words!! Megaman 10? No no no, Megaman X! So that being said, why not a 10/10? PLUS: classic controller, nuff said. Yeah, what held it back from a perfect score? I remember magazines originally rating Mega Man X highly and then a month or two later they got to review Super Metroid and was kicking themselves, stating how Super Metroid was the game Mega Man X should have been and that in the light of Super Metroid, Mega Man X became highly over-rated. Mega Man X is a fun game and I quite enjoy playing it but they were right - Super Metroid is a much better designed game. In comparison, a 9/10 is too high. But don't get me wrong, I am not a Super Metroid fanboy and once Mega Man X is released here, I have a feeling I'll be playing the Capcom game for far longer however you can't deny the huge difference in quality. Mega Man X has the superior soundtrack IMO. While Super Metroid may be atmospheric with a few cool tracks, Mega Man X has the more fun music with Boomer Kuwanger's being my favourite. I'll be downloading it soon as I get the my self a wii points card. How is Super Metroid anything like Mega Man X....? If MMX had been anything like Super Metroid, I never would've played it. Great review, Corbie. I concur, this game is "X-ceptional"; a 9 well-deserved! This was the first ever Mega Man game I've ever beaten, and I love it! This will be my first MMX game ever. I could definitely see this being a 10. This game is just really, really freakin' good. They're both 2D platform shooters? I'll find the magazine in question at the weekend and type the quote up. It was in Super Play. I think it didn't get a 10 because X2 is better (X2 is the closest thing to 2/3 or Legends in terms of quality imo). The Super Metroid comparison is probably because MMX does have sort of that "look for upgrades" stuff you'd expect in Super Metroid, except in a game with linear levels. @ BellGoRiiing never beat this game either, would make it to the last boss, I believe it was some sort of robot dog, then U would fight the guy in some sort of machine and I don't think I ever figured out how to hit him. I may have to get this, considering you can save virtual console games and don't have to worry about going all the way to the beginning if you lose. considering you can save virtual console games and don't have to worry about going all the way to the beginning if you lose. You don't get save states on VC games. You can leave a game and then return to the exact position later but thats the extent of its save feature. If you lose, you lose. There's no going back. Agreed Swerd. X2 is the best one ever, but the first is extremely solid, and an all around great game. The 9 is well-deserved. This was THE Mega Man game that got me into the entire series. They both have a motherfudging gun for a hand! I might download Megaman X at one point! Definitely want this game, don't know to go with the X collection on PS2 or download this? One of my favorite game on the SNES! This game needs a 10/10. No words can describe how much I love this game. This was my first ever Mega Man game back when I was 5. Greatest soundtrack ever btw. How does MMX compare to MM7? @Ryno: MMX is a lot better than MM7, don't get me wrong, MM7 is a great game, in fact one of my favorite original Mega Man games, definitely worth checking out. 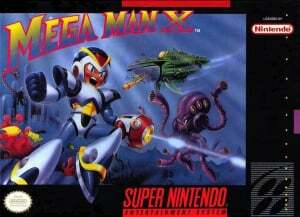 This was my first Megaman game and I loved it as a child! In fact, its one of my all time favorite SNES games and one of my favorite games of all time. I agree with everyone about the great soundtrack, smooth controls, and boss battles. The best parts of the game. Nice review! I definitely download it when it hits Europe! @Bass X0: Getting a game over just means you have to restart the level. Also, Mega Man X would have been terrible if it were anything like a Metroid game, and comparing them like that ridiculous. Two games having a genre in common doesn't mean they are (or should be) the same experience. Well I downloaded it and I got to say it's pretty hard but every time you fail you just want to play it more. This game doesn't deserve a 9 because Super Metroid came out afterwards? Both are somewhat in the same genre, but they are completely different games. I've never heard such strange logic. Great review! I love the X series. My favorite is x4. This series is the one that got me into the whole Megaman franchise! Will download eventually! This was my favorite game back in the day! I can't wait to give this one another go, my Megaman skills have rusted over the years. To me, the series went downhill after Mega Man X4, everything before X4 were great. Def gonna d/l after I get more points. I'm savin' my current 500 left from a Christmas card to get MM5. I've already enjoyed Mario Party 2, & Adventure of Link. Edit: Such an awesome game! @Capt N - If I were you I would just get some more points now and get MMX. Who knows how long it will take for MM5 to get here. One of my favourite games. The dash and wall jump make this more enjoyable to play for me than the originals. 50 or 60 Hz for pal? X4 was great too. X5 was the start of the drop in quality. I quite disliked X8 and Command Mission. Its not out in PAL territories yet but it'll obviously be 50hz. I wasn't crazy at all over X5....Things continued to get too anime-fied, seriouse, lifeless and even more distant in terms of art direction and tone for their own good. And didn't X5 have a time limit between stages? Everytime I think of X5, i think of that frustrating battle against Duff Mcwhalen. X6 on the other hand was just down right irritating, and it felt totaly rushed....I'd say it's the worst in the X series, then again i still haven't played X7, X8 OR X3. Anyways, X4 was a lot more enjoyable than X5, but the original X takes the cake as being the greatest. X2 was probably my favorite X sequal for sure. I really didn't like X2 or X3. It felt like they designed the stages and boss battles to be as un-fun as possible. Also they had terrible music. X1 > X4 >>> the rest. X2 has bad music? Seriously? I thought Mega Man X2 and Mega Man X3 had good music. So whens this coming to the UK? We should get a VC release on the 29th shouldn't we? I know its the Royal Wedding by the way!!! I disagree, I think after X5 is when the series went downhill, and as what WaveBoy said, too anime-fied, also filled with pointless dialogue, and uncreative Maverick names like Duff McWhalen. I second Bass X0, X2 had fantastic music, X3's was great as well, not as great as the previous titles though. I personally think X4's soundtrack was kinda meh, too techno for my tastes. X4's soundtrack was kind of forgettable based on what I remember....The sound was definitly different when stacked up against X1-X2. But, there were some stand outs and catchy atmospheric tracks like Web Spider's which imo perfectly captures the atmosphere and feel of a Jungle, while being upbeat and exciting at the same time. I'm sure if there were an 8-bit rendition, mega man fans would be jumping up and down. It's easily one of the best tracks in the X series if you ask me. Jet Sting Ray's is also another great one. It's got this awesome 'I'm going on an super awesome adventure' vibe to it. Easily one of my favorite aquatic themes in the franchise. 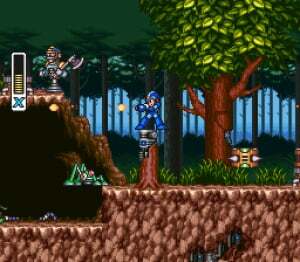 Mega Man X at 9 is perfect. Cannot give it a 10 since 2, 3, 6, and X2 are better. Yes i said 6...go back and play it. MM6 has awesome music and game design. Maybe 9.5? uncreative Maverick names like Duff McWhalen. @WaveBoy: Yes, I love Web Spider's theme, along with Split Mushroom's theme, in fact that's probably my favorite of X4. @Bass X0: That is true, I do know that the Maverick names were based off of Guns 'n Roses, I just dislike the names. I loved this game when I was younger. One of the first ones I have ever played! I just dislike the names. They're more creative than [name of power] Man that the original series is known for. True, but the thing I've always kind of disliked about the X series is that the robot masters were were mostly animals and insects instead of actually being men. Now as for the Zero franchise....Capcom took boss names to a whole new level of rubbish....I can't remember one single boss name from MM Zero.....Cleoplupia, Zanixtootoo, Bobaleviothinzki....Yea, random crap like that and you basically get the idea. I got this and discovered that the dash feature does not work. Is it one of the learned skills? I thought Mega Man was automatically supposed to do this. Nevermind, I did a little research and rediscovered the capsules with Dr. Light. I totally forgot about them. I´ve never played this one on my SNES, so i´ll probably download it, but i´d like to know how does MMX look on a LCD tv? does it have black stripes like MM10? Does it look blurry or as good as Super Mario All Stars or MM9 and MM10? Wanna know how to beat the final boss in this game? Everything before X4 were great!!! I LOVE THIS GAME. This is a Super Nintnedo classic Mega man X. Great game, But I never beat it. Sigma's fortress is just too. damn. hard. And it has the worst boss ever: Bospider. Egorapter loves this game. That's reason enough to get it. I passed the Sequalitis test.